Some of you know that I generally do not collect things other than baseball cards. By "generally," I mean I used to ONLY collect baseball cards and now that has been growing into a "general" collection of baseball (or Steelers) items. One such example is featured here: my balls. Oh, I know what you're thinking... Yes, my balls are not to be played with. I keep them safely nestled in their protective coverings. Okay, okay, enough entendre. Let's get serious about the balls I have in my collection. Yeah, sorry, no matter how hard one tries, it all goes back to sounding like a 12-year old. The upper-left auto is clearly spelled out: Cory Snyder. Snyder is certainly one of Cleveland's "Fan Favorites." He played for the Indians longer than any other team during his career (5 seasons). If I ever finish my "Top Indians by Uniform Number" project started many moons ago, Snyder would certainly be in the top running for uni # 28. I have no idea how Snyder's signed ball made its way to my collection. I will assume it was a gift. Next, we have Mickey Mouse, obtained by taking the family to Disney World back in 2009. My plan was to have The Jake surrounding him so that it looked like he was at the stadium. But, when I wrapped the printout facing inward (so you could see it behind him), you couldn't see it behind him. So, I wrapped it facing outward. Still not a fan of the look, so I will eventually come up with something. On the lower-left, we have Ken Howell. He played for the Dodgers then Phillies from 1984 through 1990. He was still on the Phillies roster through 1992 but did not play due to injury. In 1985, he pitched 2 innings with 2 strikeouts in the NLCS. The ball was given to me by a co-worker (as was the far-right, which we will discuss in a moment) who had it at her house and no longer wanted it. I gladly accepted it to add to my collection. The middle-bottom is signed by Michael Aubrey. Aubrey played with the Indians as a first baseman in 2008. The ball was busted out of a Tristar Hidden Treasures autograph baseball pack circa 2006 or so. If memory serves, it was the first (and so far only) "baseball in a pack" item I ever opened. I would guess that the COA is somewhere, but it is not with the ball itself. Knowing my penchant for tossing anything that "certifies" an object as being real, I probably threw it away. Back in 2008, I wrote a post about setting a couple graded cards "free" from their captivity (linked below). The last signed baseball I own also comes from my co-worker. It is autographed by Pat Combs. Combs played his entire ML career with the Phillies. In fact, the whole idea for this post came when I read a post on Capewood's Collections in which Night Owl sent a Pat Combs card in the trade. 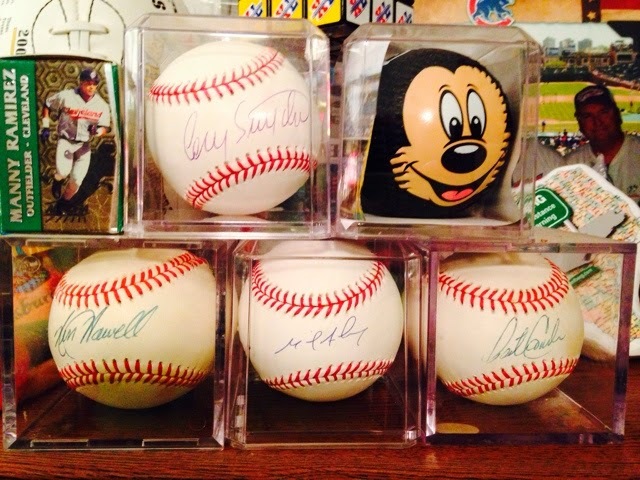 According to my co-worker, both of the autographed balls she gave me were signed in person and had belonged to her son at one point, but he no longer collects. As you can see, I've got some balls. But, not too much. Thanks for stopping by!